kind of impressionism with unexpected collage-like elements to it. In her canyon landscapes, for instance, the buttes and cliffs are simultaneously firm and smeary, while her rendering of the flora in their crevices is as delicate as lace. Her venturesome treatment of color recalls David Hockney’s. She can even be humorous, as in “Grand Canyon with Theo, Queequeg and Lunchtime Squirrel (Biographical)” where the little critter in the foreground is goofily oblivious to the grandeur all around it. Venturing out from her usual surroundings, she’s brought back some memorable visual goods. 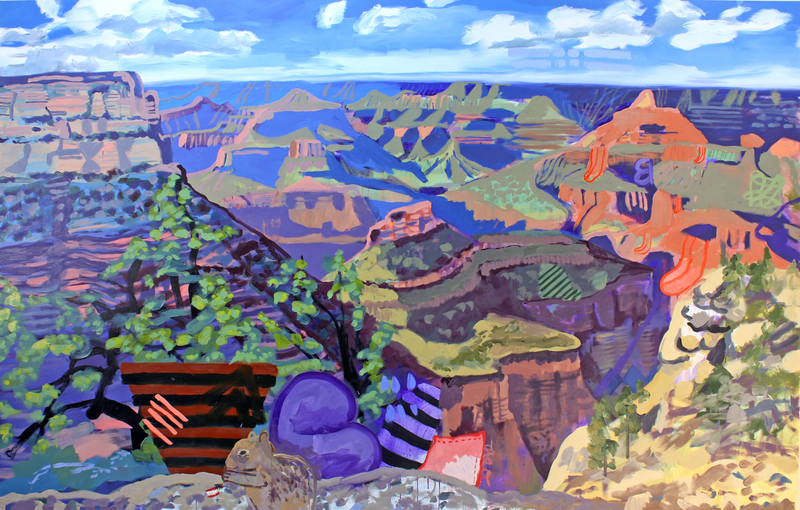 If you go: “Red Country: Mississippi and Arizona,” G. Gibson Gallery,, 11 a.m.-5:30 p.m. Wednesdays-Fridays, 11:30 a.m.-4 p.m. Saturdays, through April 21—M.U.